To Yellow Temple (flower, fruit and vegetable market), Ulun Danu Temple, Lake Beratan, Git Git Waterfall, Singaraja and Lovina Beach. Taman Ayun Temple is the Royal Family Temple in Mengwi, huge state temple of Mengwi Kingdom, the temple built in 1634 and is as our first visit. Then we will visit Ulun Danu Temple, a temple where Balinese Hinduism worship the Goddess of the lake Dewi Danu and also the goddess of rice Dewi Sri. This temple is built in the middle of Lake Beratan - Bedugul, completely drawing the unspoken beauty of panorama on an altitude of 850 M above sea level. The next journey, We then proceed to the sacred Monkey Forest of Alas Kedaton. Alas Kedaton is a forest that home to hundreds of monkeys and fruit bats. Last stop is Tanah Lot Temple, famous in Bali as the sunset temple. One Day Tour in Kintamani. Getting to know closer about culture, crafts, and enjoy the beauty and rural rice fields in Bali. To Batubulan Village to watch Barong Dance. 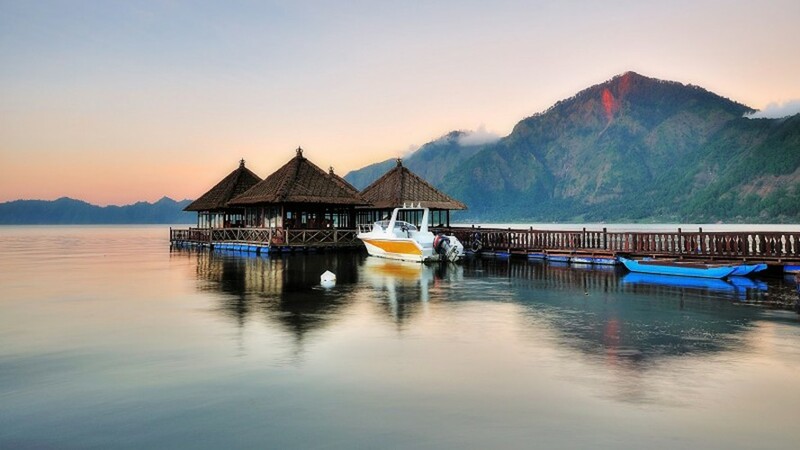 Then, visit Celuk Village, Mas Village, Elephant Cave, Kintamani to enjoy the beauty of Mount Batur and Lake Batur. Drop by Tirta Empul Temple in Tampak Siring dan Ubud or Sukawati Market. Private tour (not sharing with others). Domestic price applies only to Indonesia citizen. Overseas price applies to holders of KITAS / KIM'S or foreigners. Prices are not valid during high and peak seasons. Price for children (2-10 years): 50% of the adult price. Infants (under 2 years) free of charge. Besakih Tour where you will learn more about the history of Bali and to discover the beautiful nature as well as the uniqueness of their traditional lifestyle that still survive to this day. Our first destination is the Klungkung regency. Next, driving directly to Besakih Temple, the largest and oldest temple in Bali also considering as the mother temple in Bali. The next journey to the Tenganan Village, a village which is believed, inhabited by natives the island and they called themselves as Bali Age. After being around this traditional village, we will continue the journey to Goa Lawah Temple.This was our last stopover then we proceed drive back to the hotel. There are various factors that make Bali is well known in the whole world. There are many reasons why tourists visit Bali. Green rice fields that are arranged neatly, magical temples, beautiful beaches to art and culture of the local community has its own charm. Take a visit to Bali and enjoy these half day trip packages. These tour packages are private tour. It means you will not merged with other people when travel to Bali.